A Voyage in Consciousness is an adventure in self-exploration. The book uses simple language to facilitate exploration of one's own experience. The book is a result of the author's own experiential discoveries. The processes described in the book have resonance with a variety of mystical traditions (Buddhist, Sufi, Christian) without the traditional doctrines and dogmas. This artfully written volume exists to evoke the wisdom that is inherent within the reader, and within the consciousness of every living being. "Spiritual Identity is the ultimate source of freedom ... this book helps us move closer to our true spiritual identity, and thereby, closer to true freedom." 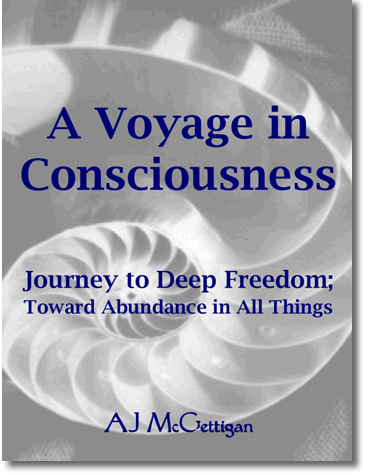 "A Voyage in Consciousness takes you from where you are into the depths of yourself in a masterful way. The book breathes with the wisdom and the richness of life." "This book is like a compass. Whatever direction you're currently facing, it will offer a new direction and lead you home again." "In ten years of reading on the subject, your book is by far the best book of its kind that I have ever read. You helped me open to many new possibilities." AJ McGettigan rides his intrepid ship of reason through the rough storms of life to glimpse the clear light for which we all hunger. A thinking man's mystic."